A young tyrannosaur that strode across the sand of what’s now Wyoming some 66 million years ago has left us a distinctive legacy — the clearest proof yet of how fast dinosaurs like T. rex really moved. The footprints are the first known multiple tracks that can be attributed to Tyrannosaurus rex, researchers say, and judging by its stride, the young tyrannosaur probably didn’t walk much faster than we do. 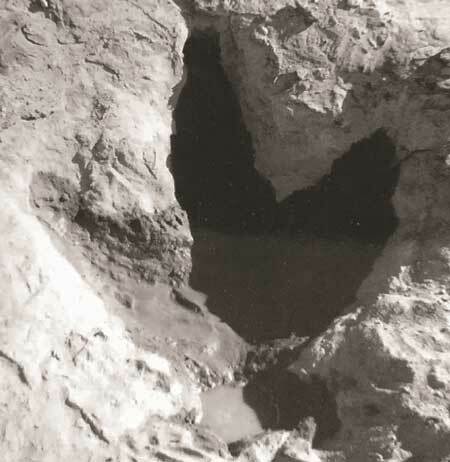 The tracks consist of three distinct prints found in sandstone just north of the town of Glenrock in eastern Wyoming, on the fossil-rich grounds of the Paleon Glenrock Museum. The fossil trackway was discovered several years ago, but Scott Persons, a graduate student in paleontology at the University of Alberta, worked with researchers at the museum and elsewhere to document and study them for the first time. 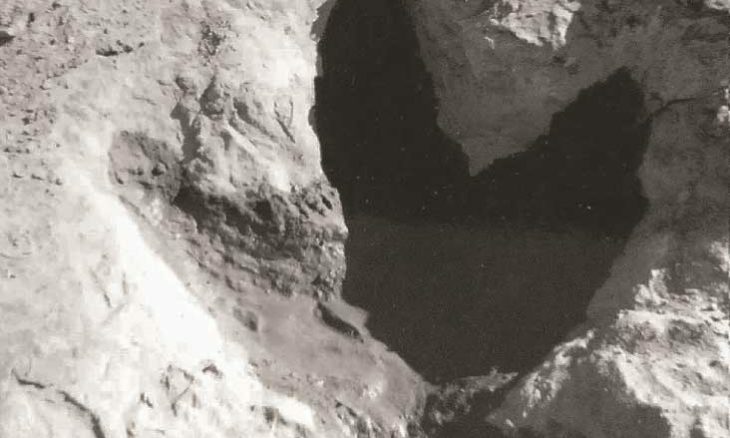 “At first, it looked like a prehistoric pothole,” Persons said, in a press statement, of the first tyrannosaur print that he saw at Glenrock. “But soon, I could see the imprints of three big toes, each with sharp claw tips. The prints are about 47 centimeters [18.5 inches] from heel to toe, and at least one left a deep impression, as much as 19 centimeters [7.5 inches] into the ancient sediment. The marks were left by a large theropod, a two-legged carnivore, the researchers say. And given that the rocks in which the prints were found date back 66 million years, they must have been made by some type of tyrannosaur, because tyrannosaurids were the only large theropods that lived in that place and time. Tyrannosaurs and other theropods walked on their toes, leaving tracks smaller than their feet. But even so, the Glenrock prints are on the small side, Persons said. “The tracks are just a bit too small to belong to a full-grown Tyrannosaurus rex,” he said. In either case, the fossil tracks provide important new data for experts about the anatomy and physiology of the giant dinos — specifically, the exact measurements of a tyrannosaur’s stride. “Having a trail of tracks is important,” Persons said. Just how quickly — or slowly — tyrannosaurs moved has been a topic of much debate among paleontologists, Persons and his colleagues explained. 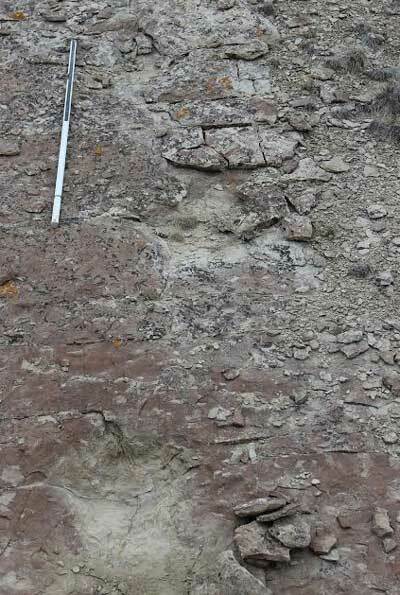 Other possible but poorly preserved tyrannosaur tracks, like some reported in Wyoming in 2004, were found among an overlapping palimpsest of various dinosaur prints. The close arrangement of those prints led some scientists to conclude that tyrannosaurs had a short stride and, therefore, were plodding, awkward walkers, moving perhaps as slowly as 1 meter a second [or about 2.25 miles per hour]. But the newly reported tracks at Glenrock tell a different story, the team said. That data, plus the fact that the prints are about 3.33 meters [11 feet] apart, leads the researchers to conclude that the tyrannosaur at Glenrock must have been moving at least 1.24 to 2.23 meters per second [or about 2.8 to 5 miles per hour]. The average human walking speed, by comparison, falls within that range, at about 1.4 meters per second, or 3.1 miles an hour. So you and I might not have been able to outrun a T. rex going at full tilt, the researchers said. Persons and his colleagues report their findings in the journal Cretaceous Research.